Google Pixel 3 XL first look: Does the intrusive notch ruin a possibly excellent phone? It’s no surprise anymore when details of a highly anticipated phone leak. Yet the amount of leaks we’ve seen for the Google Pixel 3 XL is beyond anything else. There have been press renders, camera samples and even full-on reviews before the phone has even been announced. So when Google took to the stage to finally officially announce its new flagship, nothing really came as a surprise. Google Pixel 3 XL prices start from £869 for the 64GB model and £969 for the 128GB version. 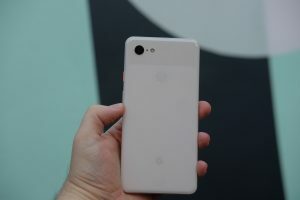 The Google Pixel 3 XL is exactly the phone that has leaked so many times: A 6.3-inch display-toting device with a single 12.2-megapixel camera on the back and two 8-megapixels cameras on the front. It runs the latest version of Android 9 Pie and is the first Pixel phone to support wireless charging. Oh, and it has a huge notch dipping into the display. I’ll start with that notch, because it’s really the first thing that catches your eye. I’ve got nothing against notches in general, but the size of the one used here feels a step too far. It droops down noticeably more than the one on the iPhone XS and as a result impacts on the content a lot more. The reason for this notch is the new, almost edge-to-edge 6.3-inch OLED FHD+ screen (2220 x 1080), down from QHD display (2560 x 1440) on the Pixel 2. There’s no room on the top part of the bezel, so the two front-facing cameras and speaker are packed into the cut-out. As much as I dislike the notch, the screen itself is great. The Pixel 2 XL suffered with numerous screen problems when it launched last year and on first glance, it seems most of those have been fixed. The colours are punchy, without feeling garish, and whites feel of brighter. There’s HDR support too. 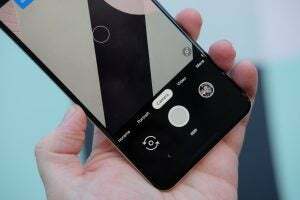 If the notch could be a reason to avoid the Pixel 3 XL, then the camera will likely be a reason to choose it. Camera quality has always been the best reason to buy a Pixel phone and the Pixel 2 remains my favourite smartphone camera – it’s still better than the iPhone XS Max, Huawei P20 Pro and Samsung Galaxy S9. Specs-wise, the camera setup looks similar. It still has a 12.2-megapixel sensor with an f/1.8 aperture. It’s also still a single-lens system. There’s no secondary camera here to help with zooming. It’s on the software side where Google has made the changes. There’s a dedicated low-light mode called Night Shot that’ll help boost brightness without adding too much noise. There’s also a Super Res Zoom mode that’ll combine multiple shots together to try and improve zooming. Two cameras sit on the front and one is now a wide-angle 8-megapixel shooter that’ll cram more faces into your selfies. The back of the Pixel 3 XL is now constructed completely from glass, rather the mixture of glass and metal Google has utilised before. It makes the phone feel softer and more rounded to hold, plus it allows for Qi wireless charging. Hopefully, the glass is stronger than the Pixel 2, which seemed to crack very easily. Inside you’ve got the usual array of high-end specs you’ll find on the majority of 2018 Android flagships: Snapdragon 845, 4GB RAM and 64GB storage (there’s a 128GB model too). 4GB RAM seems a little stingy in a world where 6 and 8GB are the norm, but I’ll have to spend longer with the phones before I know whether or not this will be an issue. Android Pie comes as standard here and it has few extra features over what you’d find on other phones. A new AI calling feature will (when it launches later in the year in the US) answer unwanted phone calls for you and the phone will turn into a sort of Google Home Hub when you dock it with Pixel Stand. Google’s phones are all about the camera and that’s once again the case here. This is shaping up to be the camera phone to beat. 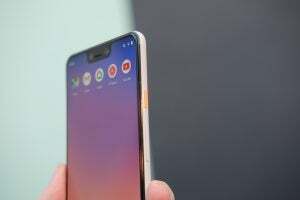 The post Google Pixel 3 XL appeared first on Trusted Reviews.